Eucharist: The Christian ceremony commemorating the Last Supper, in which bread and wine are consecrated and consumed. As you can read from this definition the Eucharist is said to be a Christian ceremony. Christians perform this ceremony but we will soon discover that this act is also imitated and perverted by the devil in many other false religious types of ceremonies. A ceremony is defined as a formal occasion typically one celebrating a particular event or anniversary. What we learn from this definition is that this is a planned occasion using planned items (bread and wine), planned actions (drinking and eating) and that this event involves willing planned participants that are present. It is also interesting to note that this event is stated to be a ceremony that commemorates the “Last Supper” and that is true and simultaneously not true depending upon your point of view and application. What I will say is that there is a connection between the two even though they are not the same events. I guess I should stop and give you the definition for “commemorate”. This word means “to recall and show respect for something or someone in a ceremony”. That definition actually has great merit to what the rest of this lesson will be focused on. But I do want to still stress that the Eucharist or the communion is not the Last Supper but rather just a recollection or memory celebrating its fulfillment. The “Last Supper” and the “Eucharist” are actually two different suppers within two different covenants as we will discover as we continue to research these subjects in the Bible. I would like to emphasize that the word “Eucharist” is not technically found in the Bible. It is a theological term used to label an event described in the Bible much like the theological term “rapture” is used to define another stated event described in the Bible. Please do not get caught up or distracted with finding or not finding a theological term and miss the lessons found in the Bible about the term. I will tell you that the English term “Eucharist” has its roots in the Greek word G2169 EUCHARISTIA. This word is used in 15 verses in the N.T. and was usually translated as a form of “thanksgiving” or “giving thanks”. That seems to teach us that Eucharist participation should contain the attitude of “thankfulness” to God. I firmly believe that and I hope that you will take hold of that and plant it within your heart going forward. Here we find one of the primary reasons why this formal church ceremonial practice is often called “communion”. Here in this verse God associates two different things that are present during the ceremony together with two other things that are not physically present during the ceremony. I’d like you to take note of what this verse is teaching. 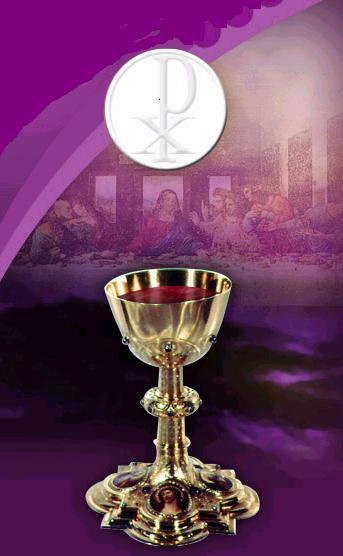 God is saying when you take the cup of wine (physically present) it is representative of you participating with the shed blood of Christ (not physically present). I emphasize the fact again that I said “representative” because we do not literally drink His blood. I know there are many people who believe that as we drink the juice or wine that it is transformed miraculously into the blood of Christ but that is not what the Bible teaches us as you should have learned this from the first lesson but this will be further confirmed with other witnesses as we continue. Bread is the second element being emphasized by God to be broken and this bread (physically present) was representative of the body of Christ (not physically present). What God is doing is taking naturally seen elements and using them to symbolically teach us about unseen spiritual elements and I seriously hope you comprehend the differences between physical and spiritual realities. I could do a long lesson on what the specific elements represent today but that is not my primary emphasis. I will introduce the fact that the bread is always stated to be unleavened. Unleavened bread is simply a basic pure wheat cracker. Unleavened bread is considered to be unadulterated bread and not bread that has been corrupted with other additive ingredients. Leaven is a form of bread additive that according to Jesus causes the whole pure substance to become tainted. Jesus taught us a lot on this subject in the Gospels. Jesus warned the disciples to beware of the “leaven” of the Pharisees (Mat 16:6). Jesus explained this leaven to be symbolically a substance of false teachings and hypocrisy. If I had more time I would explain this in more depth and perhaps that will come in a future lesson. The wine is always based on the fruit juice coming from the crushed grape and that is all symbolic of the blood of Jesus coming from the body of the Lord Jesus Christ. Grape juice is even called the blood of the fruit in Genesis 49:11 and Deuteronomy 32:14. Both of these are natural elements that symbolize and point us to the greater spiritual truths found in Jesus and if you want to learn more about them you can search your Bible for their keywords and read what they say. If you do not understand any of these verses you are free to ask questions about them. Here is a verse that compares the church’s participation with eating and drinking the communion to be the antithesis or opposite of eating from the “table of devils”. What we discover is that the church communion is called us eating from the “Lord’s Table” and that is the first major point to understand. This is another reason why some churches call the Eucharist the “Lord’s Table”. Can we literally sit at the Lord’s Table? Stop and ask yourself where the Lord is right now? Isn’t Jesus the Lord seated in heaven right now? How then can we sit at the Lord’s Table up in heaven to eat and commune with Him? I think you can see what I am doing by asking basic questions that need to be answered. Anytime we sit at the “Lord’s Table” we are expecting to partake of His meal and food. If we are seated at the Lord’s Table then we are in His presence and that means we are supposed to be communing with Him. If God is a Spirit, is this a natural meal or a spiritual meal? These are obviously symbolic figurative expressions and they are not to be taken literally while we are still physically present on this earth during the church age. In order to fully understand these statements we need to examine the context more closely. Reading in the preceding verses you should find that God was speaking of the natural people of the earth who were sacrificing their eatable offerings to idols. This is a common practice in many foreign religions still today. For example Buddhism still offers food to their statue gods. God is basically synonymizing this eating of sacrificed idol food with eating from the table of spiritual devils. Devils are real beings but they are clearly revealed to be unseen spiritual entities. It is plain to me based upon this information that partaking of communion is the positive antithesis of the negative of eating natural elements sacrificed to devils. This is a fascinating chapter to consider and learn from. God basically says within the context that natural things are not the things that are important. It is the spiritual forces behind the natural things being worshiped that need to raise the level of attention and concern for the participant. This was one of the main points from lesson one and I just tried to show you that there are other witnesses in the Bible to what I taught previously. Also within the context of this verse is a description of the priests of Israel which ate from the sacrificed items within the temple of Israel. What we are learning from these repeated patterns is that the natural food items are insignificant but the focused attention of the spirit or spirits that they are being offered to is very significant. Have you ever considered partaking of the “communion” or the “Eucharist” to be eating a sacrificial offering to God? I believe after reading this context you should reevaluate your reason for your participation. If it is not for the praise and worship of God then it could be misdirected. The context here is rich with valuable information. I included several verses that are not usually included because they must not be ignored. For example, the final verse that I gave you was where God writes through Paul “If we judge ourselves, we should not be judged”. These are much ignored statements in the modern extreme Grace message. I rarely hear any modern Grace preachers teach that we need to judge our own thoughts, motivations, spoken words and actions in order not to be judged by God. But, that is clearly the Word from God for us right here and right now! I know this because God speaks of us judging ourselves within the context of us partaking of the communion in church. Clearly these are warnings written to saved church people. Perhaps your church has eliminated communion along with the personal judging and that would be a clear sign to me that you are in the wrong church. Perhaps your church still takes communion but has eliminated the context message of being a self-judge of your own actions. You cannot separate one subject from the other simply because you do not want to view them together. Believe in the whole of scripture or die with the selective part; it is your choice to make. You can clearly read the context before these scriptures and see that Paul was rebuking the church in Corinth for getting drunk and having a party with the bread and wine in church. They are rebuked and asked “Don’t you have a house to eat and drink in?” In other words God’s communion was not there in church to fill your natural belly to eliminate your physical hunger or thirst. This church was abusing the purpose for the whole ceremony being present. God gives us a prime example of wrong human motivation for participating in communion. This church has clearly misapplied wrong reasons and neglected the purpose for the communion. This plainly proves to us that wrong motivations do not make right actions correct. This again was what I have been attempting to teach in these lessons and God continues to place additional emphasis from His Word to confirm it. Let’s go back and look at the first verse that I gave you and go through them verse by verse. You can obviously see that Paul told them the Word of God came unto them and did not come through them. This is normally God’s methods. God gives to a teacher His word and tells him or her to go and tell my people what I have said. This pattern is established repeatedly in the Old Testament and this pattern is continued in the New Testament. Not everyone is gifted to teach, not everyone is gifted to preach, not everyone is gifted to prophesy and not everyone is gifted to evangelize. Let’s continue with the rest of the first verse. There are two basic realms of topic being discussed in this chapter 11 of 1 Corinthians. The first and primary focus is upon spiritual things and the other secondary focus is upon natural things. In order to distinguish which is which you must read, study and rightly divide each and every statement. For example in verse 23 Paul starts out speaking of spiritual things from the Spirit of God and the Word of God and then at the end of the verse he finishes with a natural example of Jesus Christ partaking of the literal unleavened bread at the Passover meal which often called the Last Supper. This is an excellent time to consider a new fact. The Jewish Passover meal was often called the “Feast of Unleavened Bread” (Exo 12:17) and this was the forerunner for the communion/Eucharist in the modern church. You see I do not believe that Christians are called to revert backwards to become Jewish in the natural flesh by observing the description or application of the letter of the O.T. law. Therefore what the Jewish people did to observe the Passover is not for us in the church today. However, I do believe that most of the Jewish feasts and festivals were designed by God to point us to Jesus Christ and therefore we should at least learn about them even if we do not participate in them. The number one problem that I found with the O.T. Jews observing the Jewish Passover feast was the fact that almost everyone did it blindly without asking God or searching to find out why they were doing it and what it all meant. Don’t get me wrong they did know that they were celebrating God’s deliverance of the people of Israel from Egypt when they observed the Passover. But there was so much more than that linked to the ceremony in typology and symbolism than only a natural deliverance from a natural oppressor. Like I have said in many other lessons, God’s O.T. typology points us to Jesus our spiritual deliverer that has freed us from satanic spiritual oppression and captivity. If I had the time to teach the Passover today we would see how Jesus is found in almost every action and every element in some hidden form. You can clearly begin to understand in this statement how the Passover symbol of bread in verse 24 represented Christ’s body that was broken for us. Wow, Jesus makes it very self-evident to me that we need to take a closer look at all of the items found in the Passover supper and see how Jesus can be seen in each of them. That would probably be a good future Bible lesson for me to do work on. I want you to notice in verse 24 the reason Jesus states that we should eat the bread in the church today. Jesus says explicitly that when we eat it we need to “remember” Him and what the bread represents. The emphasis is placed upon the “remembrance” of Christ and not the natural bread eating alone. In other words the greater priority is for our mind to be exercised to intentionally recall what was done for us by the broken body of Jesus. This literally means to place the work of Jesus in the forefront of your mind and your thoughts while eating. What God implies is what I have been repeatedly emphasizing. When there is no mental recollection or reflection of Christ then the eating of the bread is worthless. Do you understand the importance of what we are thinking when we do something in church? What if you were thinking of your schedule tomorrow at work? What if you were thinking of your boyfriend or girlfriend? You could be thinking of a million different things that take away from any benefits of participating in the communion. Jesus basically said it matters what your mind is focused on. Let’s look at verse 25. Here God describes the cup but more importantly was the wine in the cup. 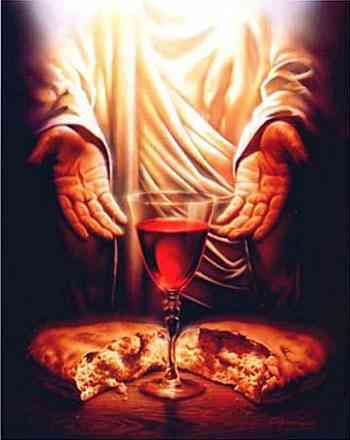 Jesus was again informing us that the wine and the cup represent greater spiritual truths. Do you remember what we are talking about here? God is describing the Last Supper again when Jesus takes the cup at the end of the table that was reserved only for the coming prophet and says this is the New Covenant in my shed blood. Wow, that is an awesome bit of information often ignored. You see in the traditional Passover meal there was always one very special cup that was filled with wine but was never touched by anyone participating in the ceremony. The cup is filled with wine and the door of the house is opened to allow the prophet Elijah to come in to take the cup. This cup was a designated symbolic reference for the one that was to come announcing the final deliverance. It was very clear to me that the Jewish people knew that they expected someone to come by this act but yet when He actually arrived on the earth they killed Him not understanding their Passover meanings. I could spend a lot of time on the subject of Passover but yet that is not my goal so I will continue to talk about how these two elements of bread and wine from Passover were passed on to Christians to do a better job at discovering and remembering what they meant. This is what I take away from what I have read so far. Nowhere in the N.T. is the church instructed to participate in the Old Testament Passover meal going forward. This old Passover supper was a meal that pointed the people of Israel to their coming Messiah. Since Jesus has already come, died and was raised from the dead that meal has been fulfilled and the only two parts of that meal that were carried forward into the church was the partaking of the blood and the body of Christ for us to remember what He has already done for us in the past. One meal in the Old Covenant was a forward prophetic symbolic supper and the other meal in the New Covenant is a reversal backward symbolic supper in remembrance of the death that has previously been accomplished by Jesus. This was pretty clearly stated here at the end of verse 26. Supper methods and elements have changed dramatically and a new perspective of looking at them was modified between the old supper to the new supper, but yet the bread and the wine elements remained true and constant and even unchanging symbols for both experiences and these represented the body and the blood of Christ the central figure of each. You may recall that Jesus is described to be the unchanging one that is the same, yesterday, today and forever (Heb 13:8) and this is revealed to us by the same unchanging elements being passed forward from the O.T. to the N.T. even though they are two different meals. Are you learning anything today? I hope that you are. Look at the first part of verse 26 and refresh your mind to what is being said. The Holy Spirit through Paul writes that we should participate in eating the bread and drinking from the cup but yet God does not give us any indication to the frequency of how often this should occur. I know some churches that do it once a month. Others do it every time they meet together. Therefore, there should be no condemnation for how often it is done as long as it is not ignored and never performed. This is in sharp contrast to the law of God in the O.T. The Passover meal was done on specific days of a specific month during the year only once. This was perpetually performed every year by the Lord’s command. Only after fulfillment was the Passover to cease for the people in the church. Since the Passover was fulfilled by Christ this would indicate that this meal should have ceased for Christians but yet by law those in the Jewish religion are still bound to faithfully perform it annually even this year. I think that is a sad state of lessons to learn from. It teaches us we better learn as much as we can about why we are partaking of the bread and the wine today while we still can. If we do it blindly like the Jewish people in ignorance we might be surprised to discover it was a futile religious act. Because of the length of this lesson, I’m going to quickly go though the other verses that I have given you from verse 27 to 30 because they all go together with what was just taught by God. Verses 27 through 30 are simply ignored by modern extreme grace preachers. In their ignorance they choose to look over a profound warning given only to Christians in church eating and drinking the elements of communion unworthily. I know a sinner could come in to visit the church and partake of the symbolic elements in ignorance and yet I do not believe that is what God is referring to, based upon the context. We can discover the target audience for this warning by observing the statements being made. For example in verse 30 God says many are sick and weak “among you”. The target audience of “you” must be the church and not the unsaved world since the entire letter was only written for the church’s benefit. True the unsaved sinner might be among the church and even read the letter but God would have reworded the statement differently if it was only written about unsaved people. Keep reading down in the next verse 31 and discover the fact that Paul includes himself in the subject statement with the personal plural pronoun “we”. We represents a combined reference of union between those previously called “you” in verse 30 with the also “me” (the writer) in verse 31. I’m going to say that again for some to grasp, Paul places himself in equivalence with those that were previously being spoken as “you” in verse 30. That fact makes the warning clearly church centered and not unsaved world directed. What Paul says is that if “We” (you and I) judge ourselves we will not be judged and that takes me back to what God said before. Those in the church are given the responsibility for judging what they are doing, what they are thinking, what they are saying, eating, drinking and etc. or God plainly states that they will be judged one way or the other. What is this judgment being spoken of in verse 31 and what are the consequences for being judged? The answer is clearly stated coming from verses 27 to 30. Many among you (the church) are sick, weak and sleep. Sick and weak are physical deficits from being whole, well and strong. Sleep on the other hand is a symbolic representation for physical natural death. This is very commonly used in the N.T. to differentiate between the “eternal separation” from God described as the “second death” in Revelation 21:8. I do not have the time to teach this fact fully about how when the Christian dies the body stays on the earth in a state of dormancy (aka sleep) in the ground but the living spirit of the saved person is found to be present with the Lord (2 Cor 5:8). Let’s go back up in the verses to learn how they are connected with verse 31. In verses 28 we are instructed to “examine” ourselves. In verse 31 we were instructed again to “judge” ourselves. Both verbs (examine and judge) are synonymous commands from God. The Greek term examine (G1381) means to test or to try. To try is a form of the word “trial” where a judge is always present. If you are the one that is “tried”, God is basically saying that it is wisdom if you become your own judge while you can so that He does not have to do it for you later. Go back to verse 27 and see how this trial is laid out before you. In beginning this verse there is the stated crime of participating in the communion ceremony by partaking of the bread and the wine unworthily. This Greek word (G371) translated as “unworthily” literally means someone who does something lacking any respect or reverence for what they are doing. These are the acts of a mocker or even a person that mimics or imitates without the correct attitude of worship. Wow, that is pretty strong if you ask me. God says these types of people were found guilty. Uh oh? Again we see the implied trial being stated. There is a crime being committed and the verdict of guilt being handed down. Who is the judge? There has to be a judge! What God is doing is sandwiching the consequences for not being our own judge in between the commands to do it or else. This is not rocket science but yet churches and preachers explain it away as being inconsequential and unimportant. However, I will repeat the warning for the slow to learn. Do not eat or drink of the symbolic blood or the body of Christ Jesus without first examining and judging your own past actions, intentions and motivations and then if there is found anything that is not worthy to participate that would be a good time to ask God for forgiveness according to 1 John 1:9. I am not going to debate ignorant Christians that try to teach 1 John 1:9 was not written to Christians and that Christians do not need to do this. If you can read the verse and the context you will see plainly that this is not true. John the writer includes himself in the personal pronoun “our” again being a “you and I’ designation. If John was required to confess his sins before God then you and I are also required to do the same. If you do not believe me that is not my problem. I tried to teach you and you rejected it. I believe that I have covered many new things that are rarely taught in modern churches. I have tried to teach you about the constant “bread” and “wine” that did not change moving from the Old Testament to the New Testament. I have alluded to the fact that this constant will not change nor ever cease even in the heavenly meal that is to come. I have not addressed this meal yet but these two elements will be found present when we are gathered to partake of them at the Marriage Supper of the Lamb. So far I have mentioned three different meals all referred to as a supper in the Bible. All of these are similar but all are completely different with increasing greater spiritual meanings. One old Passover supper pointed us forward to the coming Messiah and the current Lord’s Supper within the New Covenant causes us to reflect backwards to what God did in Jesus Christ. The future Supper to come is an entirely different subject and that will probably not be covered in this lesson series but may in a different new one. I ended this lesson with God’s warning for doing something good and right with wrong reasons and I pray that you have learned this and take it to heart. Thank you for taking the time to read and study the Bible and share what you have learned with your friends to help me spread the Good News of Jesus Christ. God Bless!